Party of power remains Russia’s richest political organization, while parties founded after April’s political reforms have yet to find much of an audience. The Central Election Committee has released information on the fundraising of 19 political parties in the second quarter of 2012. Twelve of the parties included in the report were founded since the reform on founding political parties, which came into effect in April. The political parties raised a total of 1.59 billion rubles ($50 million), 1.1 billion of that went to party of power United Russia. Of the new parties, only Sergei Baburin's Russian All-People's Union can boast of any real funds at all. Even taken as a whole, the opposition parties would not be able to compete with United Russia in terms of party funds. In second place after United Russia is the Communist Party of Russia (KPRF), which raised 275 million rubles ($8.6 million). After them came the Liberal Democratic Party of Russia (LDPR) with half as much as the Communists - 127 million rubles ($4 million). The Just Russia and Patriots of Russia parties received 59 million rubles ($1.8 million) and 43 million rubles ($1.35 million) respectively. Earning the least of all the "old" parties was Yabloko. Its party workers only succeeded in collecting 93,000 rubles ($2,900) for the quarter. Sergei Ivanenko a member of Yabloko's Political Committee did not see anything unusual in this. He said that these relatively modest receipts are linked with "seasonal fluctuations." "We have never been particularly flush," Ivanenko said. "We have to play within the restrictions set by our opponent, the current authorities." The Russian All-People's Union, headed by former nationalist and rector of the State Economic University Sergei Baburin, was on Yabloko’s heels with a total collection of 66,000 rubles ($2,000). The remaining 11 parties that were registered after the political reform and opened up their accounting statements to the Central Election Commission have not received any money yet. "We only opened a week ago. We don't have any money yet but we will be trying. We will open our election accounts and accumulate funds during the election campaign. 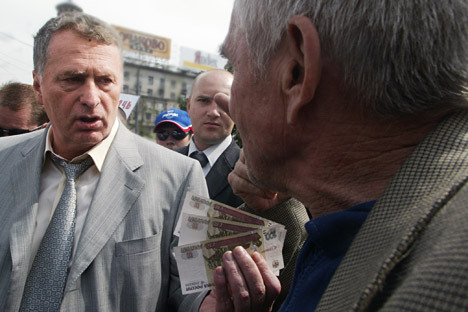 Whoever has the most money will win," said Anatoly Panfilov the Head of the Russian Green Party. Galina Khavraeva, the leader of the For Women of Russia Party is convinced that the situation will change when the parties open their regional accounts. "Funds will start flowing then. But for now we are fine as we are," she added.